S&P Europe 350® Dividend Aristocrats® measure the performance of S&P Europe 350 constituents that have followed a policy of consistently increasing dividends every year for at least 10 consecutive years. Like the (US) Dividend Aristocrats “big brother”, the European Dividend Aristocrats also tend to outperform its benchmark, lower volatility and annual risk. By showing the recent performance of the European Dividend Aristocrats, some active dividend growth investors may be able to identify potential bargains. The European Dividend Aristocrats index total return is 3.76% for last month. Based on the YtD total return of 15.17%, versus 13.16% for the benchmark, the European Dividend Aristocrats show a good out-performance. 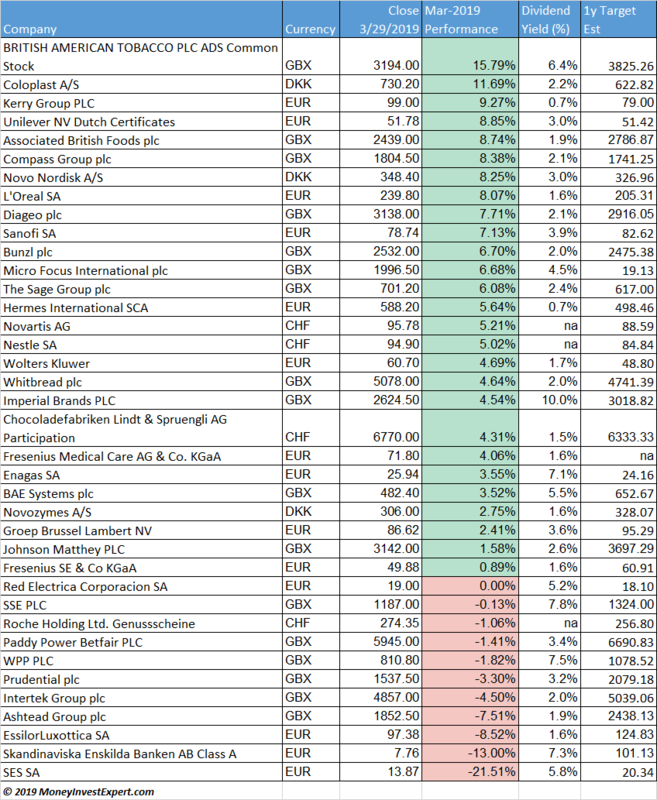 The table below lists all European Dividend Aristocrats companies, sorted descending by and lists closing price per end of month (3/29/2019), dividend yield and 1year target price estimated by analysts.